Posted on November 14, 2016 at 3:22 pm. Did you know? The Arlington County Office of Emergency Management recently completed a study with Virginia Tech to identify the people in a community who are “touchstones” for information during crisis. Teachers were at the top of the list—meaning they are some of the most likely people to tell their friends, families, neighbors, and co-workers when an emergency is occurring! 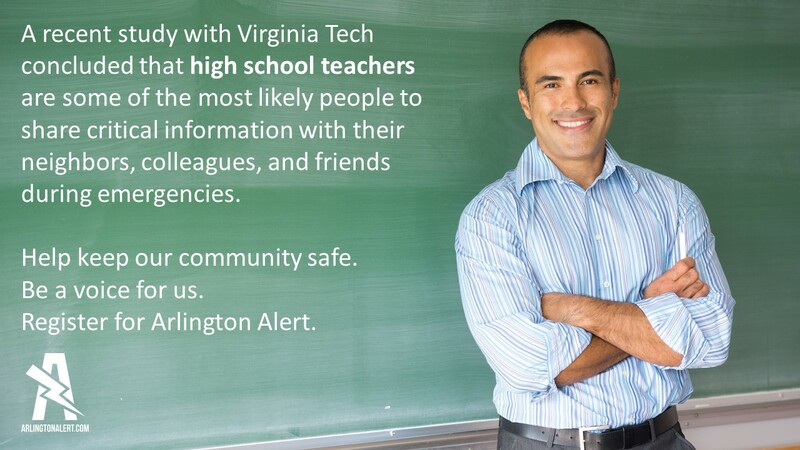 Please strengthen our community by enrolling in Arlington Alert- it takes less than 5 minutes. Visit www.arlingtonalert.com to sign up. Register for Arlington Alert during November and a box of crayons will be donated to APS.